Stylish Aluminum Liv'it Shelf Hides A Retractable Screen | OhGizmo! Forget Disney World, I’m Going To Diggerland! 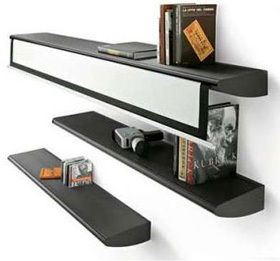 The Liv’it shelf, designed by Matteo Ragni, is the perfect solution if you’ve chosen to go the projector route for your home theater, but don’t necessarily want a large white screen hanging in your living room all the time. The shelf is made from stylish anodized extruded aluminum, and comes in your choice of red, anthracite or aluminum colors. It has a decent load capacity of about 66 pounds, which is all the more impressive since it also contains a self-rolling projection screen that’s about 50 inches by 66 inches in size. The top shelf which features the retractable screen will set you back about $1,870 from Panik-Design, but you can also order a set of matching smaller shelves that will help camouflage its real purpose. ← Forget Disney World, I’m Going To Diggerland!